The ADCO ‘Original’ Squeegee Cutter uses a special coolant to produce a wet-cutting edge suitable for all types of squeegee rubber. 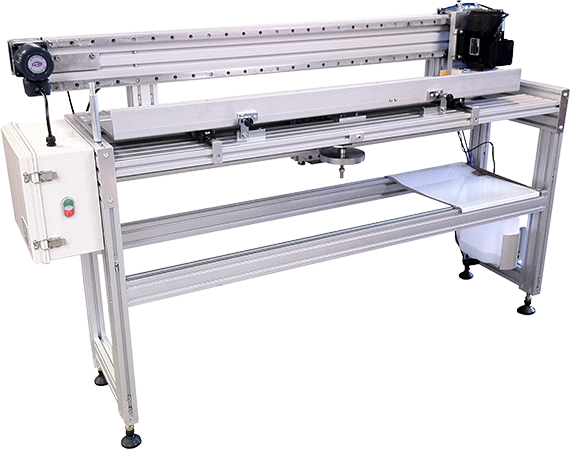 Model B Semi-Automatic is equipped with a motor driven rotary disk cutting carriage that wet-cuts from right to left and stops automatically on the left side. After each cut the operator manually unlocks the cutting carriage and moves it back to the far right-hand position, then re-locks to begin the next squeegee cutting cycle. This innovation is centered on the premise of a rotating blade that trims a very thin strip of squeegee rubber to .03” - .04” (.8 - 1.1 mm) in one single cutting pass. Squeegee Cutting Length 1350mm 53"
Cut Thickness .8mm to 1.1mm .03" to .04"
D. Integrated coolant tank with fluid level sensor prevents damage to the cutting blade when fluid reaches below security level. F. Rotary cutting system offers excellent, fast and clean high quality squeegee edge without messy grinding dust. Cutting the squeegee minimizes solvent absorption. G. Exceptional print quality, no edge swelling. No squeegee resting period needed, squeegee is ready to print immediately after it is cut. H. Long durability of the squeegee edge and higher production rates are achievable. I. Quick, repeatable and sealed precision wet-cut squeegee edge. Linearly even edge for superior ink deposit uniformity, improves fine line resolution and truer color likeness. J. User-friendly and easy setup with minimal learning curve. K. No PLC or pneumatics offers less maintenance and associated components. L. More compact to reduce packing/shipping cost and some assembly required. N. Motor driven rotary cutting blade wet-cuts squeegee in one single pass. Cutting speed is 1 meter (3.28 ft.) in 150 seconds, depending on type of squeegee rubber.